Master Gardener Tom Vincent demonstrated to a group of 16 people how to make biochar at home on Saturday, March 30. Click here for Biochar Notes. Have you always wanted to start gardening but hesitated because your soil was terrible? Maybe it is sandier than at the beach or hard as a brick in summer? Or perhaps your soil seems sterile, bereft of natural organisms that contribute to plant health? One soil amendment that has been gaining in popularity to remedy poor soils is “biochar”. Simply put, biochar is charcoal made from organic material which is inoculated with nutrients, moisture and microbes. When added to garden soil, the porous nature of biochar allows it to hold on to moisture, nutrients, and microbes that plants need. In addition, the stable nature of charcoal means it will stay in the soil for hundreds of years, sequestering carbon in the soil, improving soil fertility, and reducing the need for chemical fertilizers. Cedar Grove organic compost is still available to Tilth pea patch gadeners at $45 per cubic yard and $55 to off-site Tilth gardeners. Contact Ida. Get on the gardening space waiting list. Click to download and review the agreement. For more information about pea patch plots, contact Land Steward Ida Gianopulos. The Mary Alice Kois Kois Permaculture Food Forest is incubating for the winter. Work will begin again in March on Thursdays at 11 a.m. at the Tilth Sustainability Campus, 2812 Thompson Road, on SR 525 between Freeland and Bayview. Contact Michael Seraphinoff at 360-544-2278 for details. On the frosty morning of October 14, Tom Vincent loaded vegetation debris into a small metal barrel (retort). The retort with tiny air holes was sealed and placed inside an outer barrel (kiln). 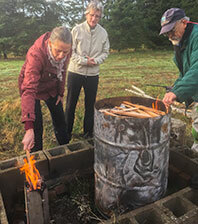 Those assembled at 9 a.m. helped prepare the biochar kiln, a top-lit up-draft stove by adding fuel. The fuel was lit from the top and covered, once the fire was burning well. Tom explained that the smoke from the top should appear as clear, shimmering air. The burn was estimated to take about two-hours. Tom then pulled out a frying pan, duck eggs and foil-wrapped bread and potatoes to make everyone breakfast. Oh my! Cooking was interrupted occasionally to tweak the fire so the emissions remained clear. After all, this process is a trial-and-error kind of thing. Around midday, Tom, tossed water around the burner to cool it down. Then pulled out the retort to find lovely glass-like, crunchy charcoal. Good for an artist or for its intended use — to mix into soil as an amendment. The porous structure of biochar acts as a giant sponge, holding on to nutrients that would otherwise wash away. Several pea patch plots at Tilth have been had biochar mixed into the soil as a demonstration. To follow Tom’s exploration of biochar and other functional farming experiments, visit his blog, Tinker's Blessing. We are doing landscape work every Thursday at 10 a.m. Come help and learn. For schedule and description of activity leave a message at 360-321-0757. Bring a lunch if you can stay awhile. To access Gary Ingram's February 28, 2016 pruning workshop handout, click. Also he told everyone to use Lime Sulfur to control apple and pear scab. It seems the EPA has banned the sale of this product for home use, and WSU is now telling us to use a copper based fungicide. Download this Scab Handout Gary just wrote. We did it! Thanks to everyone who contributed and for a $300 grant from the South Whidbey Garden Club.To get involved, Prescott (phone: 360-682-8642) with questions. Consider how you would like to use the facility. 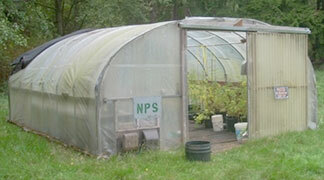 It includes the hoop house and fenced areas with weed barrier cloth and plant bedding frames. Additionally, there are five propagation seed racks at $150 each and other miscellaneous materials (hoses, two rain-barrels and potting material). Help us design a program utilizing this wonderful resource? If you haven't visited the upper meadow at Tilth, it is a delight. The Garry oak meadow and the forested trails of native plants are maturing. 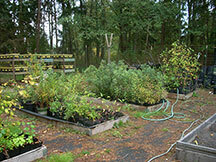 They are under the care of Tilth and have benefited from a variety of grants from NRCS-WHIP, SARE and Whidbey Island Garden Tour as well as private donors. Members of the Native Plant Stewards have played a large role implementing and guiding much of what it has become today. We welcome you to get involved with this project. 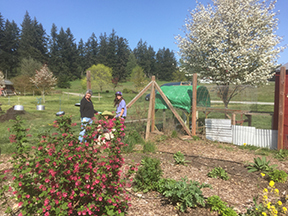 The Whidbey Veterans Service Corps (WVSC), a project of the Whidbey Island Veterans Resource Center (VRC), has interested military veterans preparing, planting and harvesting two pea patch plots in the South Whidbey Tilth Community Garden this growing season. This will provide veterans a place to grow some of their own vegetables, as well as provide surplus vegetables for other veterans, their families and the Good Cheer Food Bank. Vets will have a chance to learn about and experience the beneficial and healing powers both of gardening, growing their own food, and of being of service and giving back to their community. The VSC mission is to provide opportunities, especially to younger returning vets from Iraq and Afghanistan, to apply military service skills and mission teamwork abilities to service projects for one another, their families and their communities; and to give back to the South Whidbey community at large.The Veteran's pea patch plots are sponsored by the WVRC and South Whidbey Tilth. Contact J.C. May for information.